Thanks to local activists Pam Barker and Debbie Schwey, as well as dozens of other local organizers, residents of the Clermont County Village of Amelia will have the chance to vote on dissolution of the Village on May 5 of this year. Events of the past two years have led these and other residents to propose dissolution of the Village, which would vest local governance in the hands of Pierce and Batavia Townships. Two years ago, the Village hired its former Mayor as its first full-time administrator, who in turn hired a personal secretary. Then, the Council proposed a new earning tax to fund their over-spending. These local organizers gathered 509 valid signatures to place the issue before Amelia voters, fully 64% of those who voted in last municipal election. COAST has made a donation to the cause in Amelia. The City, entirely predictably, has embarked on a campaign of fear and misinformation to dissuade voters from voting “yes” on the dissolution. COASTers may e-mail the campaign at DissolveAmelia@yahoo.com or visit their website here. 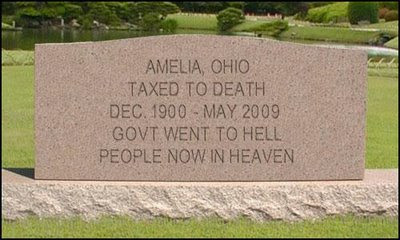 Donations may be sent to “Dissolve Amelia Now,” c/o Debbie Schwey, 19 Floral Drive, Amelia, Ohio 45102. Oddly enough, the person leading the charge to dissolve this 100 year old village is a resident of the neighboring Pierce Township. Hartman has tried several times over the past 10 years to lead a movement to dissolve the village -- and his tactics are also grounded in fear. Amelia's administrator resigned, there is no need for an earnings tax, and yet the Dissolve Amelia group puts the spectre of an earnings tax before the citizenry on a regular basis. Who is using fear? Furthermore, how will the citizens of Pierce Township benefit from adding 3000 people to the population? Yet you endorse this movement.... strange. Oddly enough, the village can implement an earnings tax at will because Ohio Revised Code allows this action. So the spectre looms still, with or without the village administrator. Fear? The supporters of the village are making phone calls to the citizenry telling them they won't have police or fire help should the village be dissolved. Who is using fear tactics now? They try to scare the citizens into keeping this outdated form of goverment by telling lies...strange.